Predominantly we erect steel, build structures, columns, beams, unload trucks and climb on the buildings. I also weld. We work on all kinds of commercial steel frame buildings of varying heights and varying footprints. It must get pretty hot doing what you do; how do you stay cool? I drink lots of water. In the summer it’s impossible to stay cool! The iron heats up quite a bit. This summer I started to wear old long sleeve dress shirts because the material keeps the sun off my skin and helps keep me cool a little bit. I like to build furniture and rock climb and I enjoy hanging out with my little girl. Got any crazy stories about your job? This story really happened to an old boss of mine. He was sliding down a tube column, basically just a square tube, and he forgot that there was a knife plate – a connection – about 30 inches off the ground. Just as he remembered, he said “uh oh”, and tried to push off of the column but was already sliding and didn’t get out of the way in time. He ended up ripping his scrotum in half. They were able to put him back together, and he’s had a kid since then. Not only did he show everyone what it looked like after it healed, but he stood on top of a table to do so. What is the funniest thing you’ve heard on a job site? Every day is a barrel of laughs (sarcastically). What is the stupidest thing that’s happened on a job site? When you’re connecting iron beams you have to align the beams with the holes in the columns, and in order to check and see if the holes were aligned, you usually use a wrench. So this one guy instead used his finger. And then signaled for the crane to come up, and it cut his finger off. No matter what, no one’s finger is stronger than a crane! Have you had any crazy injuries? Nothing hellacious, but I’ve got stuck in a couple of pinch points and had a few near misses. What do you mean by pinch points? Once I was working on a building, and we had these diagonal tubes (wind braces), I was on the bottom, my partner was on the top, and it came loose and pinched my chest in between the brace and the column. The brace got me in front and the column was on my back and I got jammed up between the two of them. It’s quite dangerous. You constantly have to pay attention, you can’t fall asleep on the job, that’s for sure. During the 1880’s ironworkers were paid only $2 a day, equivalent to about $61.50 today. The percentage of injuries in ironworking is among the highest of any career. 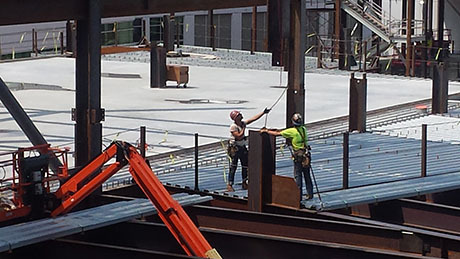 On average, 37 out of every 100,000 ironworkers will die from falls, collapsing, falling or swinging objects, electric shock or other on-site risks. The Ironworkers Union launched a “zero fatality” campaign to help recognize and avoid workplace hazards. “In the Blind” – when the crane operator cannot see where the iron is headed. 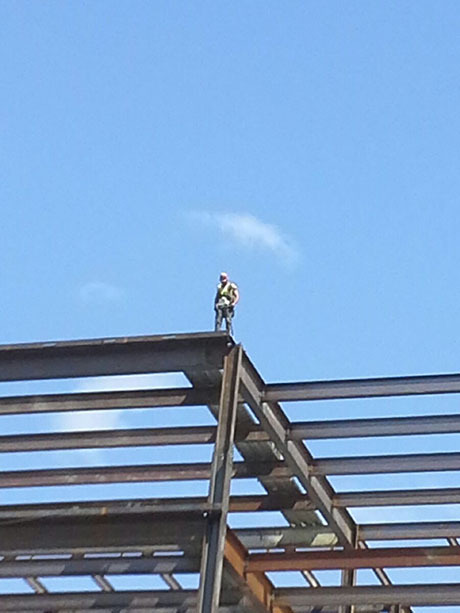 “Martini” – a newbie ironworker who attempts to maintain balance but just looks drunk. 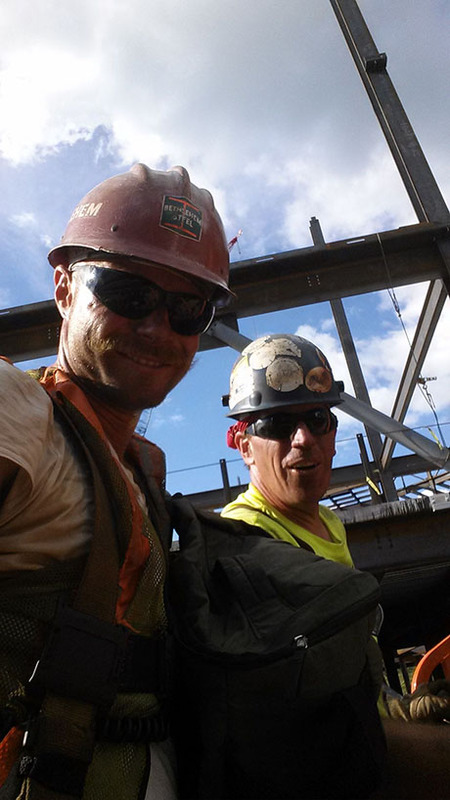 “Rod God” – a super experienced ironworker or foreman. “Sledge” – an ironworker’s tape measure. 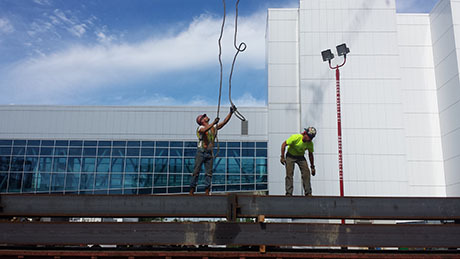 “Topping Out” – connecting the last beam on the building. Often ironworkers will be seen with their pants tucked into their boots; this is not a fashion statement, but a way to prevent getting caught up in them and tripping.